Tzolkin, local Anthro Tigress/Vixen Hybrid reports, "The SED (Society of Evil Doers) blimp came in, and was jamming cellular communications, claiming they were 'unauthorized'. A few of us were annoyed by the thing since it called us stupid, essentially, claiming Morti, local wallaby, to be king of the world or some nonsense. Borris, local polar bear, threw a harpoon at it and I shot some rocks with my slingshot. But what was really interesting was that Hotaru, local human, got out what turned out to be a flare gun, and launched a flare, after which a good many Kunoichi corp. employees showed up at the same time. The SED blimp took off after that." When asked if the Kunoichi Corporation seemed to oppose these actions of the SED, Tzolkin replied, "It would seem so, at least. Either that or they have decided that the SED is a pain in the neck. Unrelated, but later on, a giant two-headed plastic snake came in and tried to eat Natasha, local coati. Borris malleted it without much luck but a rock slingshotted at one of its glass eyes caused it to screech and slither off." When asked what Morticon's problem was with cell phones, Tzolkin said, "I don't know. My suspicions are that Morti is paranoid about Kunoichi Corp."
I observed a disturbing event in the Rose Garden today. Darius, local ferret, acting with the authority of a safety/protection organisation of some sort, assaulted a young rat who came into the Garden with a cart of bracelets to sell. He shouted something about her being in violation of this or that code of conduct, then immediately fired a strange gun at her. The gun's ray, to my vast astonishment and horror, turned her into a pile of bacon! Darius claimed the task well and truly accomplished and merrily split the pile of bacon with another fur. When questioned, he said he was merely doing his job: protecting SpinDizzy from unauthorised and potentially dangerous materials. He made mention of a transmogrification incident which happened well before I arrived here on SpinDizzy, but wouldn't elaborate about it. Portia, local red panda, arrived in the middle of the discussion about the 'baconization' of the young rat vendor, and proceeded to challenge Darius about the verity of his occupation. She claimed he had made up the organisation that employed him. Darius denied this, of course. I merely observed this conversation, as I have no knowledge of the organisation, but, being a new arrival, no knowledge that it is fraudulent, either. Eventually Darius became frustrated, tore off his badge and hurled it to the ground, stomping it flat. He stormed off, leaving me more than a little bewildered. Is there a safety and security organisation, and does (or did) Darius work for it? Why was Portia so forceful in her challenge to Darius? I sensed there was a bit of history between them, but I have only my intuition on that. Is this the sort of thing that goes on regularly here? I'm glad I have no wares to sell! DTF, local wolf, has been notably absent from the Rose Garden, and seemingly all other areas of SpinDizzy for quite some time it seems. Today he seems to have returned none the worse for his disappearance. When asked about it he gave only enigmatic answers, but seems to be in good spirits and having done something unusual. Sitting around the Rose Garden with others, including Galanodel, another local wolf, DTF surprised many by first putting a nonanthro lioncub in Galanodel's lap and playing music on his accordian for entertainment. Meanwhile, Tzolkin, local Tigress/Vixen hybrid, happened in and after being greeted by all in attendance, received a nonanthro tigress cub to occupy her lap. After a short time a bit of an argument broke out between Tzolkin and Darius, local ferret, over the fate of the Department of Safety and Purity, Galanodel lifted the tigress cub into his own lap, lest it be hurt if the argument escalated. Fortunately it did not, but the question still remains... what is DTF doing with a lioncub and tigress cub anyway? When asked about it, he said "you'll see". Does it have anything to do with his absence? As of press time, we don't know... but we think it does. There's been recent speculation that DTF had been off constructing wagons of some sort at another location, but that has yet to be confirmed or denied by him or confirmed by any other reputable source. 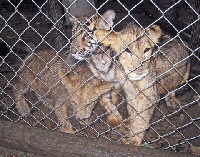 While SpinDizzy News was able to covertly acquire a photograph of the cubs, and apparently a lioness cub as well, after they were playing in the spring mud at an undisclosed location, it seems that only time will tell the full story and if history is any indication, DTF is probably creating something unique and unusual. Patch O'Black Four Kolor Kitty: Gadget and Gizmos A Plenty. Okay, we're off to a slow start here at Four-Kolor Kitty. Since last week, we only got two questions in. The first was from Argon, and I'll be looking into it in a later column. 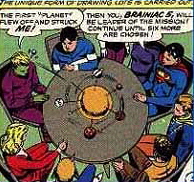 However, this week's topic comes from a question asked by Austin: Why is the Legion of Super-Heroes using, well, this thing to choose a field team and its leader? Well, first, let me explain who the heck this group is. The Legion of Super-Heroes are a group of super-powered teens, living and saving the galaxy about 1000 years after the days of Superman, Batman, and the Justice League. Now, if you are keen-eyed, you will be saying, "Say, isn't that Superman at the table with them?" Well, no, that is actually, Superboy, as in Superman when he was a teen. 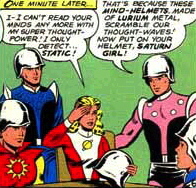 You see, the Legion of Super-Heroes first came about during what is known as the "Silver-Age" of comics. This was an era noted for it's grand adventures, introduction of the more familiar versions of various super-heroes, and, well, a certain lack of basic science knowledge. Some would say that were attempting to spin whimsical stories. I say that some of these folks were suffering from brain-fever-driven delusions. I mean, look at it! What person in their right mind would think that getting bonked in the head with a little model planet is a good way to pick who should go save the galaxy? Of course, security is important in one's headquarters, so the Legion had, among other items, the Ceiling Detection Device. No, it didn't detect ceilings, it was a ceiling that turned red when any intruder entered. Okay, I guess that is kind of useful, but I get this image of the ceiling turning red every time a visitor came in. 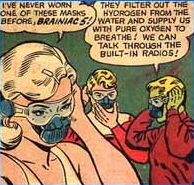 I think I need to point out that breathing pure oxygen is not really a good idea. But, setting that aside (the writers did, after all! ), by wearing these with the Mind Helmets, you get the full "Darth Vader-wannabe" look. Need I even mention the Medallion Making Machine? Now, I do have an idea why in the world this group of future adventurers would have all these useless gizmos. You see, a lot of their equipment was donated by the grateful planets they would protect. I am guessing a few of the planets were not quite as grateful as others. 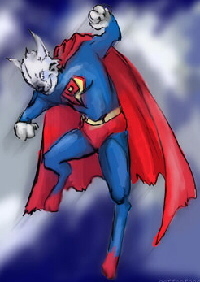 "Hmmm....say, you know that old thingamabob that turns blue when there is a rise in temperature? Let's send that to the Legion and tell them it is a great honor to have one!" I am sure lots of planets used the Legion as a dumping ground for high-tech junk that no-one else would take! Well, that's it for this week! Remember, send in those questions or suggestions for topics! See you in a week! Hi there, here's your Spindizzy @Action News survey for this week. 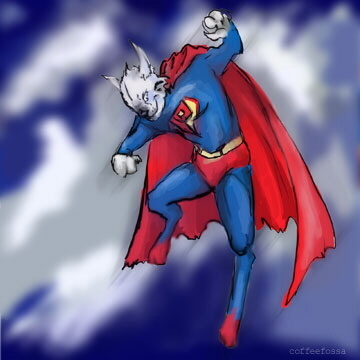 If you were given the chance to write a comic book, what would it be like? What kind of stories would you tell? Please get your answers to me by this Friday. Thanks! PatchO'Black mews, "A super-hero comic, in the classic style, I think." Mouser says, "I'd write a comic about an evil band of mice and how their plans to conquer the world were constantly thwarted by a band of noble and heroic weasels." Cirro snorts. "A comic book? I've no time for such drivel." Momo giggles "Hello Momo comic!" Darius says, "I would make an action packed comic, probably having to do with Overpowered Villians and heros, that would breach the limits of comic ultraviolence." 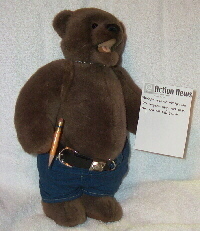 GrumpyBear grumbles, "I would write horror stories about depression and death, and everyone would have really long bangs, and wear Hot Topic clothes, and they would all talk about death and dying and Myspace, and they'd all be cutters, but only a little bit, just enough to make them feel life." Haruka ponders, "If I had such creativity, I'd probably write some sort of period piece set in Meiji period. Young ronin saves the day sort of thing, I guess." Borris Gruffs, "Tales of Borris the Polar Bear, and his Travels"
Argon says, "Well, one with centaurs saving the day, of course!" 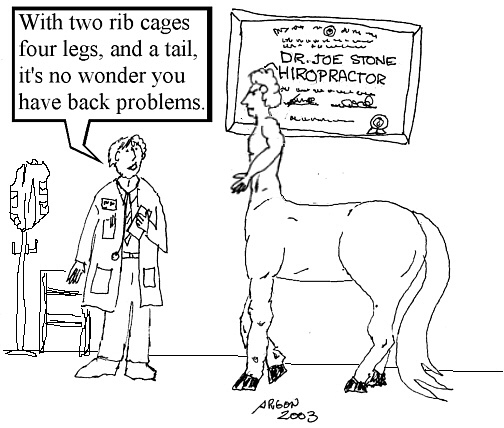 A "classic" Doze Garden cartoon from the March 9, 2003 issue.